Each class includes relaxation preparations, group craft explorations and individual exercises related to liberating the instrument, eliminating obstacles, and achieving a being state. Students also do scenes and monologues using the Eric Morris System. Privates consist of one full hour of instruction to address whatever the individual student needs to work on. This might include, preparing for an audition, preparing for a role in a movie, T.V. show or play, dealing with specific material in class, or confronting personal obstacles that must be dealt with in a more intimate setting to protect the actor’s privacy. 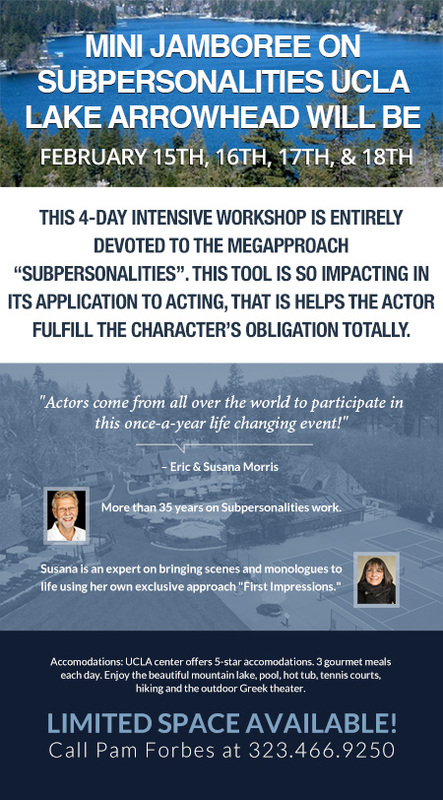 This 4-day Intensive workshop is entirely devoted to the megapproach “Subpersonalities”. This tool is so impacting in its application to acting, that is helps the actor fulfill the character’s obligation totally. This workshop is entirely devoted to “Imaging” and “Subpersonalities”. Imaging is the 26th choice approach and a megapproach so powerful that a whole book has been written about it. “Imaging” is a tool that addresses all seven major obligations of material. “Subpersonalities” helps the actor fulfill the character’s obligation totally. This workshop is entirely devoted to Externals. It’s the exploration of animals, people, inanimates, and insects. Using these four areas the actor is able to embody a sense of the animal, person, inanimate, insect, and fulfill the demands of the character. This workshop is a lot of fun, and a guarantee for a happy ending of the year. It takes place at the wonderful U.C.L.A Conference Center in beautiful Lake Arrowhead where the combination of the Jamboree content, the food, the great accommodations, and outdoors are unbeatable! The emphasis of the 2018 Jamboree will be the work on scenes and monologues, and the exploration of a panorama of craft work designed to address and fulfill the responsibilities of material. The Intensive Course is Susana Morris’s creation. 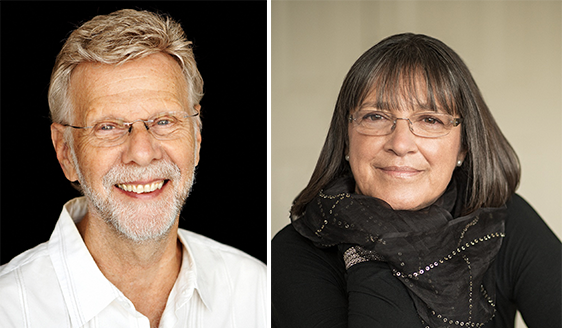 Eric and Susana started the Intensive Course in 1996 and, it has become the most sought out of all courses. Every year for twelve consecutive months a hand picked group of actors embark together in a magical and wonderful journey of exploration, and sublime ensemble. The Intensive remains the most remarkable and complete collaboration that enables each and every actor to reach his potential, flourish, and thrive. Eric covers the craft in its entirety from A to Z while Susana works methodically bringing monologues, scenes, audition pieces, scripts, and plays to life being truthful to authors intentions. The purpose of it all has always been, and still is today the need to provide a safe environment for the actor to master his craft, and pursue his freedom and his career. Susana is known for working with the actor on stage, over the phone, on Skype, and on set. The cost of the tuition varies according to the nature of the Private. The workshop will be closed from August 1st through September 9th 2018. Classes will resume on September 10th 2018. The workshop will also be closed for the holidays, from December 14th 2018 through January 6th 2019. Classes will resume on January 14th 2019.